The Associated Press has lifted a video from a social media account affiliated with the Islamic State that purports to show the destruction of ancient artifacts in Iraq's northern city of Mosul. The destruction is part of a campaign by the ISIS Islamic Jihadist in order to eliminate what they view as heresy. 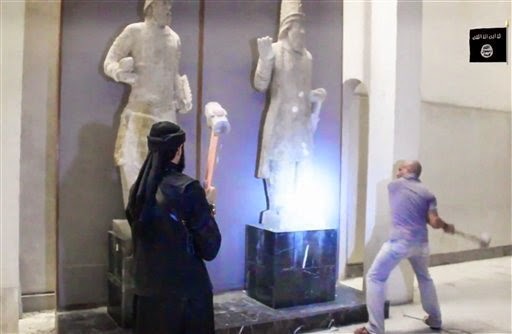 "The five-minute video shows a group of bearded men inside the Mosul Museum using hammers and drills to destroy several large statues, which are then shown chipped and in pieces. The video shows a black-clad man at a nearby archaeological site inside Mosul, drilling through and destroying a winged-bull Assyrian protective deity that dates back to the 7th century B.C. In New York, U.N. spokesman Stephane Dujarric said the U.N.'s cultural agency, UNESCO, is examining the video. "The destruction of cultural heritage is reprehensible and criminal," Dujarric said, adding that it robs current and future generations of the history of their past. Among the most important sites under the militants' control are four ancient cities — Ninevah, Kalhu, Dur Sharrukin and Ashur — which were at different times the capital of the mighty Assyrian Empire. The Assyrians first arose around 2500 B.C. and at one point ruled over a realm stretching from the Mediterranean coast to what is present-day Iran. Also in danger is the UNESCO World Heritage Site Hatra, which is thought to have been built in the 3rd or 2nd century B.C. by the Seleucid Empire. It flourished during the 1st and 2nd centuries as a religious and trading center. Mosul, Iraq's second-largest city and the surrounding Nineveh province fell to the militants during their blitz last June after Iraqi security forces melted away. 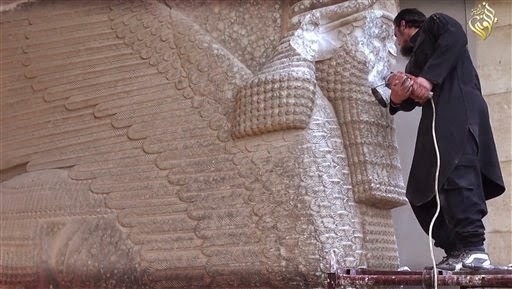 The region under IS control in Iraq has nearly 1,800 of Iraq's 12,000 registered archaeological sites and the militants appear to be out to cleanse it of any non-Islamic ideas, including library books, archaeological relics, and even Islamic sites considered idolatrous." "Oh Muslims, these artifacts that are behind me were idols and gods worshipped by people who lived centuries ago instead of Allah." "The so-called Assyrians and Akkadians and others looked to gods for war, agriculture and rain to whom they offered sacrifices. Our prophet ordered us to remove all these statues as his followers did when they conquered nations." The damage to Iraqi artifacts in Mosul is the latest episode in incidents that have targeted the nation's heritage. In January, Islamic State militants ransacked the Central Library of Mosul, smashing the locks and taking around 2,000 books — leaving only Islamic texts. Days later, militants broke into University of Mosul's library. They made a bonfire out of hundreds of books on science and culture, destroying them in front of students."